Most RAW processing tools (e.g. Lightroom, Capture One, Adobe Camera RAW) do many things brilliantly. Indeed, many landscape photographers consider them to be the only tool they need to use during post-processing. These programs tend to have a clarity slider which allows you to adjust the dynamic contrast of the whole image. This allows you to adjust the overall clarity, but it does not increase the clarity on a very small scale within the landscape photograph. Something which you will notice in many very good landscape photographs is that separate colours within the image are really defined. 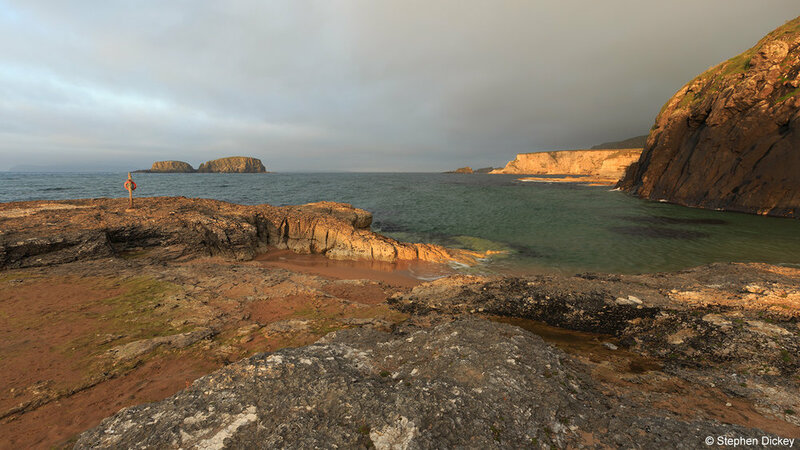 Look at the landscape photograph below and focus on the greens on the cliff tops to the right of the image. Switch back and forth between the before and after images and you will see that after this free action is applied the greens are more distinct, but in a very controlled and subtle way. Look at other parts of the image and see what it does. Give it a go on your own landscape photographs and I promise you will be impressed! To use the action load it into Photoshop (a Google search will show you how - it's easy!). There are 2 versions of the action which are called normal and strong. Try them both and see which you prefer! If you want to tweak the actions then there are instructions included. You should run this action on your full resolution files. Please click HERE to download the action file.